Akhilesh being stopped from boarding. 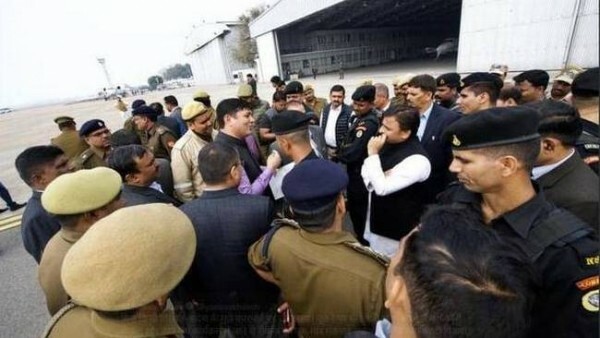 Akhilesh Yadav, former Uttar Pradesh chief minister and Samajwadi Party chief, was "detained" at the Lucknow airport after he was stopped from boarding a special flight to Prayagraj city, 201 km from Lucknow. He was scheduled to attend a function of the Allahabad University Students' Union on Tuesday afternoon. Samajwadi Party workers protested across Uttar Pradesh, leading to clashes with the police in several areas. The 45-year-old leader said that the ruling BJP, by committing such acts, had not only lost the upcoming LokSabha elections but also earned the ire of the youth. BahujanSamaj Party (BSP) supremo Mayawati denounced the action against Yadav. Hundreds of Samajwadi Party (SP) workers took to the streets shortly after party chief Akhilesh Yadav was prevented from boarding the flight. Heavy security deployment has been made in Prayagraj, especially near the High Court premises where the protests are taking place. Rapid Action Force (RAF) has also been put on duty, a district official said.